Of course, a delicate world that has created itself in such a remote and isolated realm is a delicate system. Human interruption and introduction easily disturbs such a delicate laboratory – such an intricate system that took from millions of years to evolve to survive in what might seem the least likely of places. There are a plethora of environmental problems plaguing the islands, some stemming from the pressures of world climate changes such El Niño (ENSO), others arising from commercial fishing, and overpopulation, and many resulting from the introduction of species by humans dating back to the 1800’s. Another big problem the Galapagos Islands had to face was a big oil spill in 2001.Read here what impacts this incident had on the Islands. 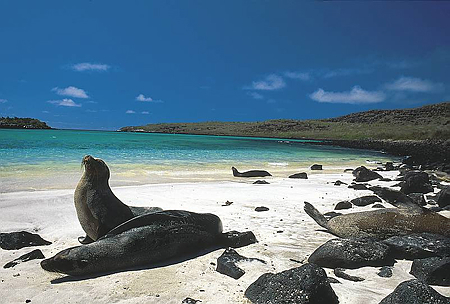 For decades, tourists have marvelled at the rich flora and fauna of the Galapagos. Despite the high prices, the stream of visitors has never broke off. In the sixties, there have been about 1,000 tourists per year, whereas there have been approximately 80,000 visitors in 2001. A second airport was built and the construction of a third one is under discussion. The park service does a remarkable job of regulating the licensing of guides, as well as designating low-impact landing sites. The National Park charges a $100 entrance fee on foreign tourists, yet receives only 25% of that. Nevertheless, the park has to deal with the conservation problems that motor yachts and their trash bring to the island. Recently, overfishing or illegal fishing has become a large issue. When migrants do not find work in tourism, they often find jobs in the fishing industry. The sea cucumber and sharks of the Galapagos have become alarming targets, both popular in Asian markets for their aphrodisiac or medicinal qualities. Due to the alarming decrease in the early 1990’s an Executive Decree enforced by the National Park service banned all fishing of sea cucumbers in the Galapagos. Fishermen were not filled with enthusiasm. Although the ban has been replaced by a quota, there have continuously been strikes on the part of the fishermen. Only recently, in April 2004, angry fishermen besieged the Charles Darwin Station and demanded the right to use greater nets and longer lines. The seizure ended with an agreement signed between César Narváez (Ecuador’s Minister of the Environment), and the artisenal fishermen. The conflict, however, is far from over. The mere human presence of people alone does not hold such a severe threat to the native species. After all, its humans did not arrive alone. Since the times of the first inhabitants, non-native species have been imported to the Islands, often with drastic consequences. Many of the species introduced are not rare or deadly in themselves, but when placed on fragile Islands where life took years to adapt, mere rats, dogs, cats, and goats have dramatic effects. Feral dogs, most likely imported to the Islands as mascots of early settlers, have been a threat to tortoise eggs, native iguana species and even penguins. Four goats were introduced to the Santiago Islands in the early 1800’s, went rampant and one estimate calculated that their population had grown to nearly 100,000. Due to their constitution and ability to feed on nearly any plant, goats alone may be responsible for the local extinction of up to 4 or 5 species of vegetation and compete with the Galapagos tortoise for their food source. A newly introduced wasp species has been sited on the Islands, and may be responsible for a declining number of caterpillar larvae, a food source for finches. The Charles Darwin Research Station constantly searches for solutions to the problem of introduced species. To find out about this and other projects they are working on check out their website. While there are a great number of issues and problems facing the fragile environment of the Galapagos, there are success stories and potential solutions as well. The introduced eradication program, though slow going, has eliminated feral goats from several small islands. Dogs are now absent from the island of Isabela. The efforts to reintroduce and repopulate species such as elephantine tortoise have increased their numbers dramatically. Environmental education efforts on the Islands help their inhabitants understand the larger picture and need for conservation, and responsible tourism and enforced park guidelines help preserve the Galapagos for the future. But there are seemingly endless needs for the park’s preservation, and always limited funding. Other than what little budget it receives from the Republic of Ecuador, the National Park relies entirely on funding from philanthropists, fundraising efforts of the Charles Darwin Foundation, Inc. and other private organizations. When you stop at the Charles Darwin Research Station during your tour, feel free to leave a much appreciated donation. The Charles Darwin Foundation, Inc. is the fundraising arm of the Research Station and would more than greatly appreciate your contribution. Visit their website atwww.galapagos.org and find out how you can help. You or your organization, corporation or business are strongly encouraged to contribute (most likely tax-deductibly) to the preservation of the world heritage that are the Galapagos Islands. ~ by FSVSF Admin on 8 December, 2011.